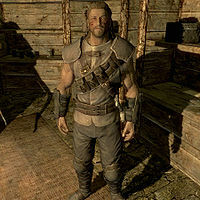 Thrynn is a Nord thief and a member of the Thieves Guild in Riften. Before joining the guild he was part of a bandit clan, but left after a violent and fatal disagreement with the chief over killing women and children. Although his marauding days are behind him, Thrynn likes to keep his fighting skills constantly honed. After waking up at 8am, Thrynn will loiter around the central area of the Cistern for two hours before heading over to the practice target to improve his archery. At 2pm he stops and heads over to the cooking spit for a two-hour lunch. After wandering around for another two hours, at 6pm he heads for the training room and practices his blade skills until 10pm. He will then hang around the Cistern until 4am, when he heads back to his bed, which is right next to the alchemy lab. He wears the standard Thieves Guild armor, gauntlets and boots and is equipped with a leveled sword (up to elven quality) and a hunting bow supplemented by 12 steel arrows. He also carries two lockpicks and two leveled gems. "You're pretty tough, I respect that. Bringing in a lot of coin for the Guild, making us look good too. Let me know if you need anything, okay?" "I'm the heavy hitter around here. When someone needs pushing around, I'm the one they send in." "Brynjolf pulled me in a few years ago. Said the Guild was lacking some muscle, so I joined up." "I've busted heads for Maven Black-Briar when she wants to keep her name out of it. Pays good, so why not?" "I leave all that sneaking around nonsense to everyone else; believe me, when I'm coming for you... you'll know it." "Used to run with a bandit clan in The Pale. Turns out I didn't like them and they didn't like me, so we parted ways." If you ask him about his bandit past, he'll gladly tell you his story: "I joined up with them maybe ten years ago. Small clan... maybe twenty men. We'd raid villages, rob caravans... but it was always about the killing for them. Don't get me wrong. The first few years with that clan were some of the best years of my life. All the food I could eat, all the wine I could drink and all the women I could bed. We raided a caravan one spring... I think it was a few wagons with some farmers moving to a new village. They didn't put up much of a fight. All that was left were the women and the children. Then the leader of our clan... Garthek... he ordered us to kill the rest." If you ask him whether this was a usual occurrence, he'll press on: "No, we usually let them go. I refused to do it, and Garthek ordered the clan to kill me as well. Luckily, I had made some friends with the clan who immediately sided with me. We tore each other to pieces. After it was over, those of us that remained simply went our separate ways." If you inquire about Garthek's fate, Thrynn will tell you with satisfaction: "I left his head on a pike at the wreckage of the caravan. Never knew what became of the rest of the clan that survived. I suppose they moved on just like I did." Before you convince the guild of Karliah's innocence during the quest The Pursuit, he'll angrily refuse to speak with you: "If you don't have a good reason to be partnered with Karliah, you're dead." Afterwards though, he'll be enraged with Mercer: "I won't rest until Mercer's dead. How could he murder Gallus and betray all of us like that?" When you rise to the rank of Guild Master, he'll jovially say: "So, now that you're Guild Master, how about drinks for all of us!" Should you get suspended from the guild, he'll refuse to converse with you: "Pay your dues and we'll speak." Thrynn will at times engage in random conversations with fellow guild members, as listed below. Cynric: So, Thrynn, you were a bandit, huh? Thrynn: Yeah, what of it? Cynric: So is it true, bandits get... you know, real friendly with the wildlife? Thrynn: Is this your tale of single-handedly fighting off a pack of trolls or my favorite... where you bedded four women on the same night? Vipir: Well, if you don't want to hear it, that's your loss. Thrynn: If I wanted to hear a tall tale, I'll read a children's storybook. Get some better stories, Vipir. Esta página foi modificada pela última vez à(s) 18h10min de 23 de março de 2014.